Students and community members gathered to welcome this year's Sparrow on Friday afternoon. 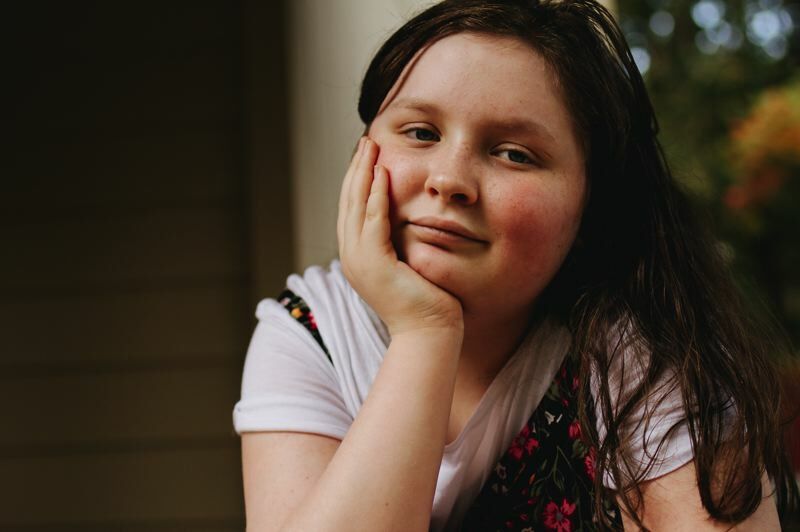 An 11-year old Hillsboro girl with substantial medical needs has been adopted by Hillsboro High School as part of its Sparrow Clubs program this year, and students at the high school have plans to raise some money to help pay for her medical treatments. Lilly Hazel has been living with a rare form of cancer for the past several years. For the remainder of the school year, students will volunteer to complete community service projects in a number of different ways. Hillsboro locations of Black Rock Coffee and Steele Group Inc. have sponsored the Sparrow Club, donating $10 to the family for every hour the students volunteer, up to 256 hours. That money will help alleviate the family's medical costs and other expenses, according to organizers. Some students will also fundraise independently to donate to the cause, but volunteering is encouraged, Portland Sparrow Clubs program director Laura Queen said. Several local schools sponsor Sparrow Clubs, which work to empower students to help others through acts of community service. Last week, South Meadows Middle School adopted four-year old Forest Grove resident Kailanie Dykes, who has lateral meningoceles and leukemia. Next month, Liberty High School will adopt five-year old Beaverton resident Laylanni who has B-cell acute lymphoblastic leukemia. The clubs go beyond helping families financially, Queen said, they provide emotional support as well. "Once the kids meet their Sparrow, all of a sudden they become a part of that community, and the support and the love (they give) ... it's like the Sparrow becomes a celebrity," Queen said. "It's the emotional side and just feeling that support of all these people care." That connection goes the other way too, Queen added. Students learn about empathy and doing things for others. "It looks like what we do is really help the family, but the gift that the family gives to the kids is really the greater gift," she said. "The kids think that it's all about what they are doing for the Sparrow, but in reality it's kind of flipped. It's what the Sparrow is doing for them to open their eyes … what it means to do things for other people and care about other people." In 2015, Lilly and her family moved to Hillsboro from California, where things quickly shifted for them. Her father died unexpectedly from a hemorrhage caused by a fungal infection in his brain a few weeks after moving to Oregon. Lilly's mother, Carrie Hazel, decided to stay in the area with her two daughters. A year later, then-8-year-old Lilly started to have severe pain in her leg — something doctors previously attributed to growing pains. After an X-ray, MRI and bone biopsy, Lilly was diagnosed with Langerhans Cell Histiocytosis, a rare cancer that causes lesions and tumor-like growths. The cancer often goes away on its own, Hazel said, and doctors decided to monitor it with x-rays every few months. Lilly was beginning to feel better, but a year later developed diabetes insipidus, another rare disorder involving the pituitary gland. Her oncologist immediately recognized the rare type of diabetes as a sign the Langerhans had returned, Hazel said. "At that point, we started a year's-worth of chemotherapy, so she went into chemo weekly for three months," Hazel said. "She had surgery to put a port-access in, and then after the weekly for three months, she's been going every 3 weeks to have an infusion," Hazel said. "It's tough for her. It's been tough for all of us, but it's definitely been tough on her." Lilly has benefitted from visits with a therapist, as well as trips to the Dougy Center, a nonprofit organization in Hillsboro which helps children and their families deal with grief, Hazel said. "She's been doing really, really well, but also it's just a lot for a kid to deal with," Hazel said. "She is really looking forward to being done with chemo in a couple months." Lilly looks forward to being able to play softball again, and has no shortage of hobbies she is passionate about, her mother said. She plays the trumpet, and loves art — including drawing, painting, and creating things out of scraps. She loves animals and enjoys cooking, with dreams of being on the show "MasterChef Junior" one day. Hazel said she is thrilled about the support and love Lilly will receive being a Sparrow over the next few months, but wasn't initially sure about the idea. "I was a little hesitant at first because I know that there are kids out there who are sicker than she is ... but if there is something that I can do to make her happy and make her feel supported during this, then we are going to do that," Hazel said. "Lilly was really excited about it. She loves the idea that she is going to be paired with kids from high school … she is really smart and precocious and I think she likes being around kids that are older because it gives her something to look up to and aspire to." Receiving that emotional support is something Hazel is looking forward to most for Lilly, and for their family, after spending a lot of time feeling isolated with hospital visits. "We are still relatively new here," she said. "It's difficult to replicate the level of social support that we had back in California, so on the level of just getting to know people and having that emotional, friendship-level support is really nice for her, and for all of us." Lilly and her family received a warm welcome at Hillsboro High during an assembly Friday, Jan. 11. 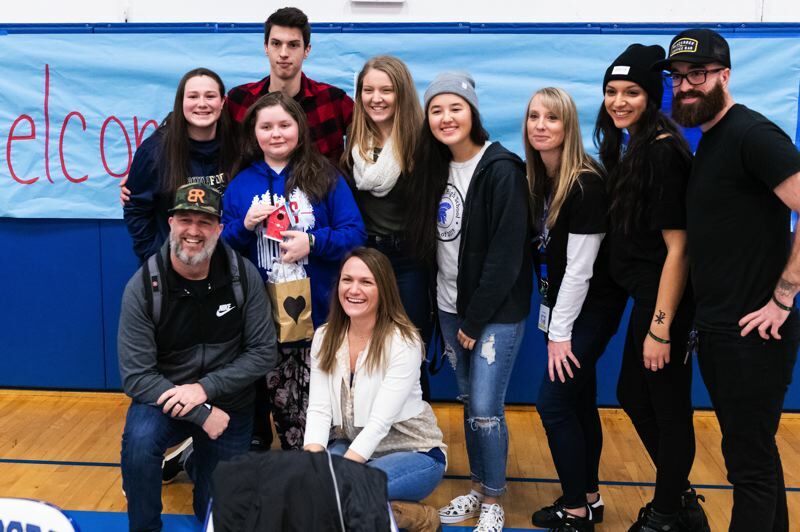 Hundreds of students packed into Hilhi's gymnasium to meet Lilly, hear her story and learn about what they can do to help her family. 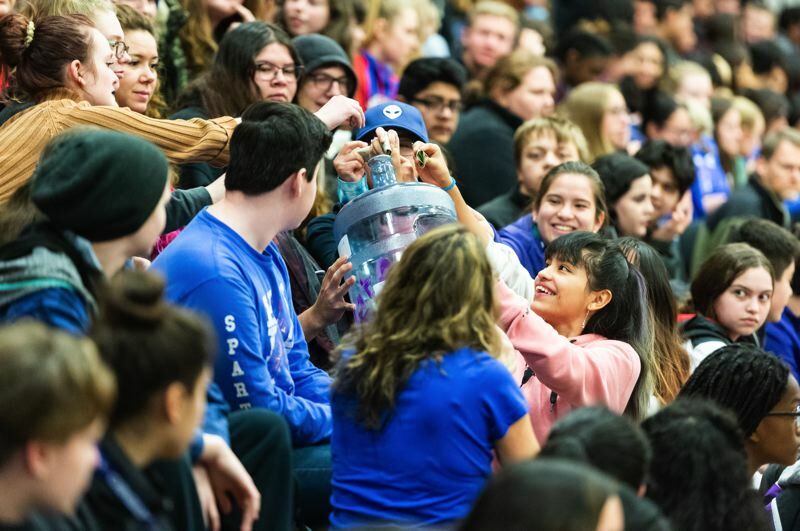 "That one act — that one hour that you would give to somebody else, is an opportunity to impact yourself as well," Cory Burket from Black Rock Coffee said to students during the assembly. "That one act of compassion could ignite something significant. One hour — that's it. ... We believe in you. We are here to fuel your story so you can fuel Lily's story. ... Thank you for partnering with us to make an impact in Lily's life."